Another way that can help to spread the word of God in the Year of Faith is film. Whether it is a short video clip or a feature length film, visual representation of faith is powerful. You can see examples of visual representation being powerful in modern books that have been made into movies. Books like The Hunger Games and all the Harry Potter books have been made into film to further the reach of their story. Spreading the Catholic faith should be no different. I read a post titled, “Film and Faith” recently that talked about this topic. The post features clips from Jesus of Nazareth and a new movie set to come out The Bible. The post talks about the power of film has to evangelize, and how modern technology helps that. When a movie is really well done, good film quality etc., people are more inclined to watch it. I am interested to see how the History Channel interprets things with their new film The Bible. “The Rite” follows skeptical seminary student Michael Kovak (O’Donoghue), who is sent to study exorcism at the Vatican in spite of his own doubts. Anthony Hopkins plays a character by the name of Fr. Lucas – an Italian priest and veteran exorcist – who befriends Michael and helps open his eyes to reality of demon possession and the need for rite in the modern world. 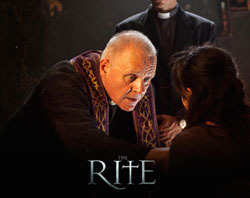 The film is inspired by the 2009 book The Rite: The making of a modern exorcist in which journalist Matt Baglio chronicles a priest’s apprenticeship with a local exorcist. Though the movie is of course suspenseful at some points and even ‘thrilling,’ ultimately it is a story of faith, and the immense powers it can hold.